This letter was written by 18 year-old Mahlon VanDyne (1843-1864), the oldest son of Anthony Wayne VanDyne (1821-1898) and Lydia B. Hendershot (1821-1905) of Washington, Belmont County, Ohio. When this letter was written in late December 1861, Mahlon (or Malon) was serving in Company F, 63rd Ohio Infantry under the command of Capt. Charles H. Titus. The original 63rd OVI was organized on December 1, 1861, at Camp Worthington in Columbus and at Camp Marietta in Marietta, but only enough men were available to fill four companies. Hence, the 63rd was not officially designated as a regiment. 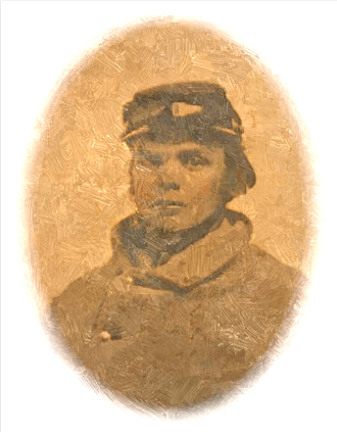 After his service with the 63rd Ohio, Mahlon enlisted in Company I, 12th Ohio Cavalry. This regiment was mustered into service November 1863 and attached to the Department of the Ohio. Mahlon died on 31 July 1864 in the military hospital at Camp Dennison near Cincinnati, Ohio. I seat myself this pleasant afternoon to let you know that I am well at present and I do hope that you are all well and enjoying the same good state of health. We have come back to Camp Putnam again. We left Camp Dennison on the twenty-eighteenth day of December and we arrived at Camp Putnam on the 28 and we are now a fixing up to stay here all winter but we don’t know how soon we be called on to go away. But I think we will get to come home now soon to recruit for more soldiers to fill up the regiment. I would like to stay with the boys but I expect to be sent home now soon. Well, we expect to get our pay tomorrow or next day for sure and if we do, will send some of it home to you. Well Father, I received your letter just a few minutes ago and was sorry to hear that so many piled on you but if I had been there I would have had a hand in it too. But if I ever get home, I will whip Lige till he will wish he had never seen me before. I want you to write and tell me how you are a getting along. You must try and keep out of them heathen’s way for they are dangerous than they seem. I have seen a great deal of things since I have been gone which I wouldn’t have seen if I had stayed at home. There is only about three hundred men in camp now and it will be some time before it will be filled up. We have a pretty cold place to sleep at night but I expect we can stand it. There are three of our fellows in the hospital now — William Hendershot has got the measles and Peter [Beck] has got the consumption. Marshall Trigg is sick also. We don’t know what ails him. Well Father, I will have to close my letter for this time but I remain your respected son. I would like to see you all first rate but I don’t know how soon I will get to see you. Tell Sis I got her letter and was glad to hear from her and my dear mother too. I want some of you to send me some postage stamps for I have not got any here very handy. Direct your letter to Camp Putnam, Marietta, Ohio, 63rd Ohio Regiment, in care of Capt. [Charles H.] Titus, O.S.M.I. This entry was posted on Tuesday, October 28th, 2014 at 5:37 pm	and posted in Uncategorized. You can follow any responses to this entry through the RSS 2.0 feed.